Get started raising funds for your next event! 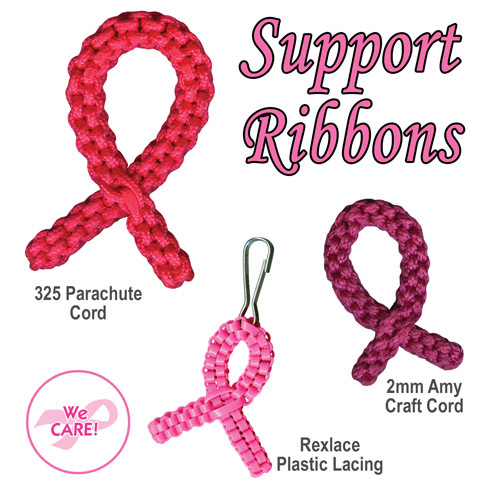 Instructions for Support Ribbons can be made using 325 Parachute Cord, 95 Parachute Cord, Amy Craft Cord, S'getti String, or Rexlace Plastic Lacing. The ribbons can be customized into any color to meet the needs of your organization. Two 1-yard lengths of Rexlace Plastic Lacing OR 1.5-yards of 325 Parachute Cord OR 1.5-yards of 2mm Amy cord. Directions: Coming soon. For now, instructions can be downloaded here.